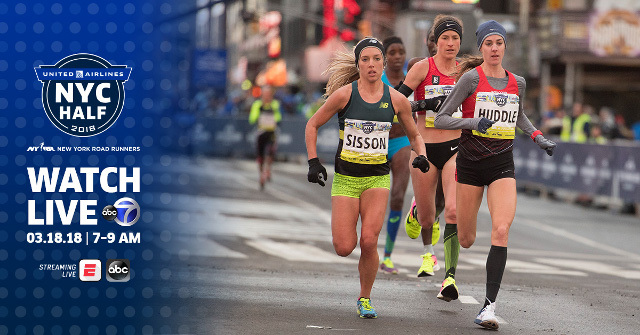 On Sunday, March 18, watch a blockbuster field of professional athletes from 14 different countries lead the way at the new 2018 United Airlines NYC Half. Notable runners include rising star Emily Sisson, fan favorite Noah Droddy, and local hero Roberta Groner. In New York, live coverage of the United Airlines NYC Half runs from 7:00 to 9:00 a.m. EDT on WABC-TV, Channel 7. Live streaming will be available on the ABC app (New York area) and on ESPN3 via Watch ESPN app (outside of the New York area) from 7:00 to 9:00 a.m. EDT. International viewers can watch the broadcast from 7:00 to 9:00 a.m. EDT via a variety of global broadcast partners. Watch your friends cross the finish line with our Find Your Finish camera, live and on demand on abc7.com (NYC) and ESPN3 (nationally) from 8:10 to 11:10 a.m. EDT.